Jessica Chastain’s performance in Miss Sloane is so good it threatens to burn a hole right through the screen. Unfortunately, it also manages to highlight every wonky piece of dialogue flowing from her ruby red lips. The film is written by a first time screenwriter and it shows. While perfectly entertaining through it’s surprisingly sleek 132-minute runtime, the script makes it clear why the Sorkins and Mamets of the world are so revered. There’s just something about political fast-talk that either works or doesn’t. Luckily for the dialogue of Miss Sloane, the stellar cast does their darndest to find a middle ground that mostly works. This sort of treatment serves the plot well in some parts, not so much in others, but it has the makings of a solid political thriller: Elizabeth Sloane is a hot commodity on Capitol Hill. She’s a powerful lobbyist who isn’t so married to ethics that they get in the way of her craft. She steadfastly refuses to lose, and will lie, cheat, steal, blackmail, etc. just to get the job done. If you’re not helping her, you’re in her way, and she will make damn sure everyone in the room knows exactly which rung of the ladder they are on, and how willingly she’ll stomp their fingers just to ascend even an inch higher. The thing is, she’s so good at getting bills passed or vetoed in the interests of supremely high paying customers that her methods are accepted, coveted even. This is why it’s so strange to her peers when she laughs off an opportunity to lobby against a bill to expand background checks for firearm purchases. The gun lobby is a powerful one, but Sloane rejects their offer and joins an altruistic boutique firm with an interest in firearm safety. She takes much of her team with her, and we follow as they navigate the murky waters of D.C. politics. 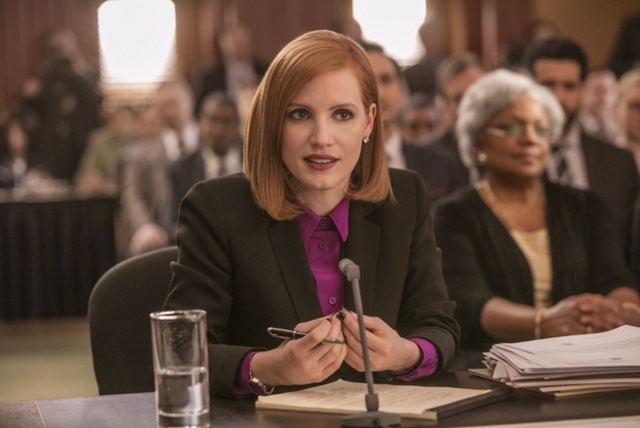 If the last few weeks have put your political skepticism into overdrive, Miss Sloane will push it to the edge. It’s an entertaining movie, front to back, and it moves at a such a fast clip that most of the flaws didn’t congeal for me until after I left the theater. It’s simply a blast to watch, and since it’s successful as a character study of a powerful woman with mysterious motivations, I found myself going along for the ride even as the more ridiculous plot contrivances began to pile up (robotic spy cockroaches are a thing), and the silly dialogue made the ensemble scenes feel like a cue card holder was just out of frame. This would all be just fine (and it mostly is) if not for the insistence that this is a smart film; a necessary film. It’s sooooo not either of those things, which makes it challenging to meet it on its own terms. A strong performance from one of my new favorites, Gugu Mbatha-Raw, helps. She elevates every scene she’s in. If John Madden (Shakespeare in Love) saw fit to lean into the schlock, Miss Sloane would be much better off. The moments of wannabe potent commentary serve only to unevenly shake up the goofy heist-film it so clearly is, most of which falls under the well-worn umbrella of “money controls politics.” Hardly new ground, and when it all comes to a head, the film doesn’t quite clear the ends/means hurdle as well as it seems to think it does. It’s uncomfortably contradictory, but this is difficult to explore thoroughly without dipping into spoilers. Hardly a deal breaker, but if I were to go back and watch the film with full knowledge of how the plot shakes out, it would be just as difficult to forgive the despicable actions which Sloane uses to get her way. Perhaps this is why Miss Sloane works best as a character study. Elizabeth Sloane is very much a product of her world, and rather than try to side with or against her it’s much more rewarding to investigate what makes her tick. She revels in the idea that by forgoing a normal life she obtains an emotional detachment which gives her the edge over the competition. She’s right, too. 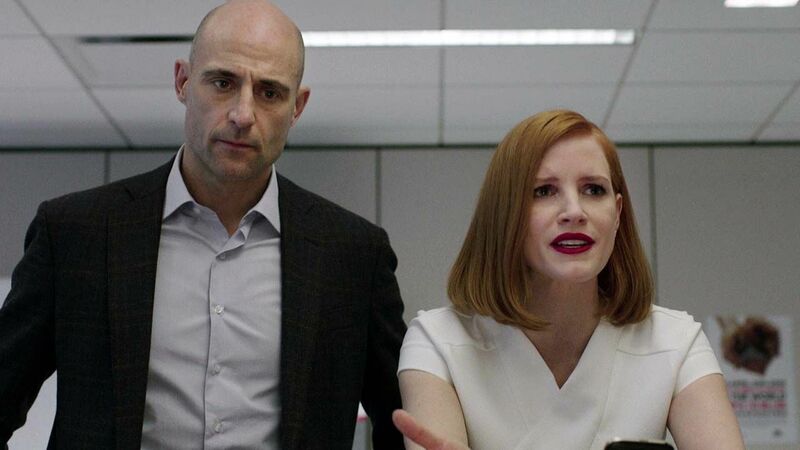 Where even the most soulless political mover-shaker would pump the breaks, Sloane keeps going, usually to the chagrin of her boss, Rodolfo Schmidt (Mark Strong, sweater-clad, excellent), and her former partner (Michael Stuhlbarg, also excellent). As the story unfolds and we peel away at Sloane’s layers, her cold outward demeanor gives way to a much more complicated human being. In these transitional moments, Chastain’s firecracker performance morphs from being aggressively verbal into something more physical and we see shades of the subdued work that caused her to run away with The Tree of Life while barely speaking a word. If there’s a reason to see this movie, it’s Chastain, but you knew that. We get to see a full range of her tremendous skill set. Like I said before, she’s so good that not only does she make a lot of the goofy dialogue work, but she highlights how it could be even better, all the while securing her spot at the front of the line whenever the superior version of this character is written. Even though it’s a silly knock off of the Sorkin style, it’s still a style that always works to some degree. It’s hard not to get swept up in the heat of things, and as much as I lament the amateurish nature of the script, it’s functional, and quite impressive given that the writer, Jonathan Perera, has never written anything else. It’s not going to win him any Oscars, but he will be getting jobs, and based on the sheer ambition of this debut, I’m excited to see what he does next. Also, look out, Chris Pratt. You’ve got competition in Jake Lacy. His performance in this flick is easily the most human. Every time he pops up in something he proves himself an actor with chops even though he looks like a hunky dolt. Only one will survive, unless you can come to an agreement. May I suggest some sort of debate/kickboxing match? Or at least a silly buddy cop movie? Heck, Chastain could play the angry police chief. 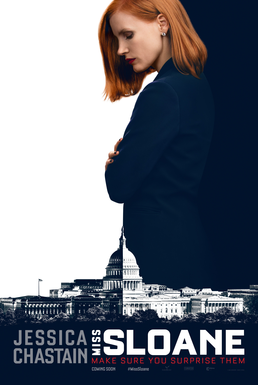 On a more dour note, even if Miss Sloane is based on only the most cursory understanding of political lobbying, I for one, am afraid, because if this film is to be believed (and I suspect that it is on some level), there’s no room for altruism in politics. Not if you want to get anything done. Miss Sloane opens in Philly theaters today.